During 1914-1918, more than 100 countries participated in World War I. It is estimated that there were roughly 37 million civilian and military casualties, with 7 million civilians and 10 million soldiers killed in the war. In 1918, on the 11th hour of the 11th day of the 11th month, WWI officially ended. The armistice agreement signed by Germany and the Allies marked an end to the long and painful conflict. This year marks 100 years since Armistice Day, the day when we remember those who fought and died in the war. As we remember the sacrifices made by the brave soldiers from all over the world, it’s a fitting opportunity to reflect upon the personal contributions made by our ancestors. Are you curious about what your family did in WWI? 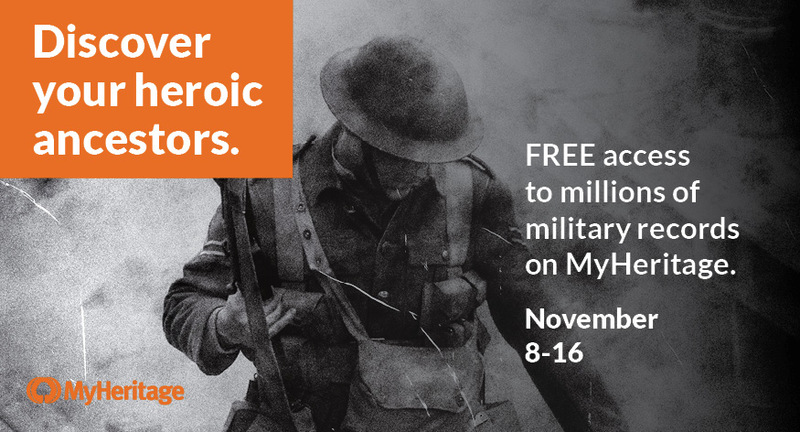 To commemorate the centennial of the end of the war, we are offering free military records on MyHeritage SuperSearch starting tomorrow, from November 8-16, 2018. Military records are valuable resources which provide insight into the lives of those who served, as well as their families. 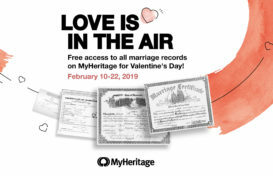 With these records, learn about your ancestors, honor their memories and their service to their country. By preserving this information, the stories, and the photos for future generations make sure your family’s contribution will never be forgotten. Search our military records for free to learn more about your family’s involvement in WWI and other military conflicts. Were members of your family involved in WWI? Tell us about your family’s stories in the comments below. My father…not my grandfather…arrived in France 3 days before the Armistice was signed. What a gift of timing! I traveled to France this past summer to find the places in his sparse journal he was sent to. What a wonderful way to remember my father long before I was born. He was in 78th Division, 307th field artillery, Battery B and transferred to Battery E for non-combat work (Oct. 1918-May 1919.) A picture of him in full uniform was accidentally thrown away. Oh, what I would give for another picture!! Gov. records were lost in a fire. I could imagine him in the locations he listed and, especially, one bridge in Buffon, France. A treasure of memories!